A couple of days ago, I was pondering a big brick of cheddar cheese that I had bought. You see, the kids love macaroni and cheese, but they only seem to like the boxed variety. While I’m not averse to ripping open a package of powdered "cheese" and adding milk, I’d rather that they eat something a bit healthier. For years, I’ve been on a quest to figure out the perfect way to cook macaroni and cheese from scratch. I’ve tried recipes that involve pureed sweet potatoes (to give the dish that distinctive orange color) and recipes that just call for cheese. I’ve tried baked and stove top varieties. My one major complication is that many recipes that approach the boxed variety call for Velveeta which I can’t use since it isn’t kosher. No matter what I try, though, it always seems to end in failure. My latest batch was rejected by both boys upon their first taste. Even B said she didn’t like it though she choked down a bowl. The culprit seems to have been the cheddar cheese – too sharp for everyone’s palate – and possibly the ground mustard. You might think that I"d give up. I probably should. However, my disappointment at the failed recipe is countered by my stubbornness. I’m determined to get this right no matter how many tries it takes. That "holy grail" will be mine and it will be filled with delicious, homemade macaroni and cheese. Start with a bechamel sauce (or, as my Dad called it, white sauce). Toast 2 Tbsp. of flour in a pan, add 2 Tbsp. butter, work the flour into the butter as it melts, and make sure it’s smooth. Slowly add 2 cups milk, making sure to whisk to remove lumps (use cream if you can handle the fat content – my cholesterol readings won’t let me 🙂 ). Some recipes call for a double boiler, but you can usually manage over medium-low heat if you pay attention. As it cooks, it will get thicker, but be careful that it doesn’t boil over or burn. It can take a while. Once the white sauce has thickened up to about the texture of velveeta, season with a bit of pepper, nutmeg, and (optional) ground mustard – don’t add salt, because the cheese will take care of that. Feel free to modify spices as needed to the taste requirements of your audience. Then add your cheese – about 2 cups of shredded cheddar, and a couple of cups of whatever else you have (mozzarella, swiss, monterey jack, pretty much anything). Add salt and/or additional cheese to taste. Add a bit of turmeric if you need it to be yellow. 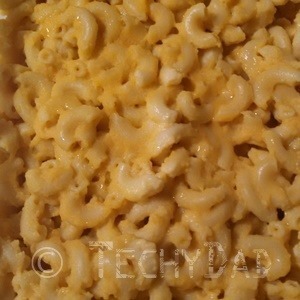 Add cooked elbow macaroni – usually I’ll cook ~8oz (dry) of whole wheat elbows. Use whatever pasta you prefer if you don’t like whole wheat or elbows. You can eat it at this point, or put into a casserole dish, cover with bread crumbs, parmesan, and a sprinkle of paprika. Cover the casserole with foil, and bake at 350 for 30 minutes. Then, take the foil off and cook for another 15 minutes (or until the top browns). If you bake it, let it cool down before serving to prevent molten cheese injuries. We keep changing the quantities of cheese sauce vs. pasta, amount of cheese in the sauce, baking vs. eating RIGHT NOW, etc. Your best bet is to start with learning how to make a good cheese sauce, and then experiment from there.